A research te-am that consists of Professor Tae-Woo Lee (MSE), Tae-Hee Han (MSE Ph.D. ca-ndidate), Prof. Jong-Hyun Ahn (SKKU), and Prof. Byung Hee Hong (SNU) has developed graphene into organic light-emitting diode (OLED) and flexible, white light with it for the first time. This team noticed that the inefficiency of graphene in OLED can be resolved by replacing conventional indium tin oxide anodes with high-work-function, low-sheet-resistance graphene anodes. The team improved the luminous efficiencies to 37.2 Im/W for fluorescent and 102.7 Im/W for phosphorescent devices, which are higher than ITO anode-based OLED. 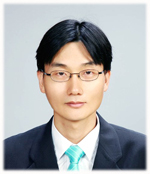 Prof. Lee who led the research said, “This research proved that the performance of current photoelectric devices can be improved by the use of graphene.” He added that the result confirmed, once again, the high utility of graphene, as it will serve as a foundation for the researches to come.